The harvest has been virtually completed and preparations for winter and next year are now underway. All of our fruit trees have been “topped” and some hedged, as the initial pruning phase begins. This lowers the tree size to a reasonable height for easier harvesting, gives the tree more strength, and with more sun exposure, allows for better sized fruit. Rodent trapping is an ongoing chore. With the change to micro-sprinklers in recent years, gophers and squirrels have become an increasing problem. In the past, our irrigation system actually flooded the growing area with 2 or more inches of water to satisfy the need of the trees, and most of the gophers and squirrels were “flooded out” as well. While the micro-sprinklers help to conserve water and fuel, the system softens the ground, allowing the rodent population to expand – sometimes at a rapid rate. Studies have shown that a single squirrel can consume 200-300 pounds of walnuts in a season. Gophers can easily kill newly planted trees and severely affect older ones. We have removed many of our sick and unproductive trees – an ongoing process which attempts to maintain economic sensibility with productivity. Some less desirable varieties have been replaced with new ones which we feel will be an improvement, but we are never sure until we harvest the fruit 3-5 years after planting – truly a long-term commitment and investment. We continue our commitment to provide our customers with the freshest, best tasting fruit and vegetables available as The Fruit Bowl celebrates its 70th season of continuous operation. 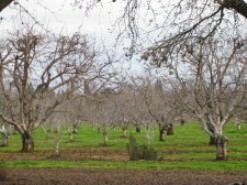 We welcome summer, after abundant rain, with renewed and refreshed orchards. This year’s cherry crop is one of quality and quantity. After 5 years of challenging crops, this is the best in recent recollection. We look forward to an excellent supply until mid- June. We are starting to pick our first peaches of the season from our over 65 varieties grown in our orchard, and the quality appears excellent at this time. We normally have a variety of white and yellow flesh peaches available each week. 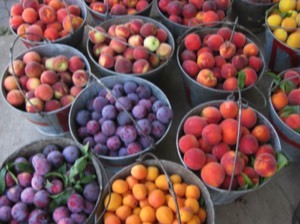 Pluots, plums and nectarines appear normal, as well. Apricots are our only disappointment this year as we estimate our crop to be about 25% of normal. The planting of our vegetable crop including basil, heirloom tomatoes and squash, has been completed. All our fruit and vegetables are hand-picked daily - a fete which requires extra effort, but provides our customers the finest in quality and freshness we have to offer. We continue to welcome your questions regarding growing organically. Although our fruit and vegetables cannot be sold under the “organic label”, we have been using integrated pest management since the mid 80’s and were one of the first growers in our area to use the bio-lures for mating disruption. We have been producing fruit and vegetables on our property continuously since 1947 in the least disruptive way that we feel is economically feasible, offering the safest and best tasting product for our customers. As we begin our 70th season, we wish to thank you for your continued support and visiting us at thefruitbowl.com. With the arrival of spring comes orchard maintenance tasks such as tying trees, keeping weeds down and fighting gophers and squirrels. Soon we will begin “thinning” our tree fruit (peaches, plums, nectarines and apricots). Most crops look adequate, making it necessary to remove a portion of fruit in order to produce a quality-size end product. Wonder why cherries are expensive? Another crazy year is before us. Sporadic production is this year’s best term. Some orchards have a “normal, but extremely early crop” and generally the later orchards have a much lighter to virtually non-existent crop. The earlier fields are more susceptible to rain issues. So, we again start the year with unique situations and venture ahead into “uncharted” territory. Planting our veggies will be taking place soon, and our local harvest should start in mid-June. Currently we are offering beautiful local asparagus and, soon, fresh local red onions. We continue to welcome your questions regarding growing organically. Although our fruit and vegetables cannot be sold under the “organic label”, we have been using integrated pest management since the mid 80’s and were one of the first growers in our area to use the bio-lures for mating disruption. We have been producing fruit and vegetables on our property continuously since 1947 in the least disruptive way that we feel is economically feasible, offering the safest and best tasting product for our customers. We are pleased to announce our cherry orchard has again received certification from Primus GFS Labs at the superior level for food safety. As we begin our 70th season, we wish to thank you for your continued support and for visiting us at thefruitbowl.com.